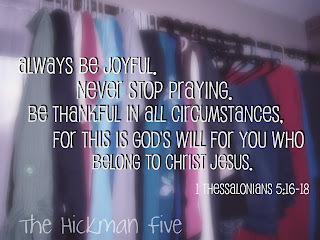 The Hickman Five - Faith, Family and Fun: Pray for it. My prayer for this post is that it meets you right where you are. That these words are the words of God not just the person sitting here typing them for you and sharing my experience. 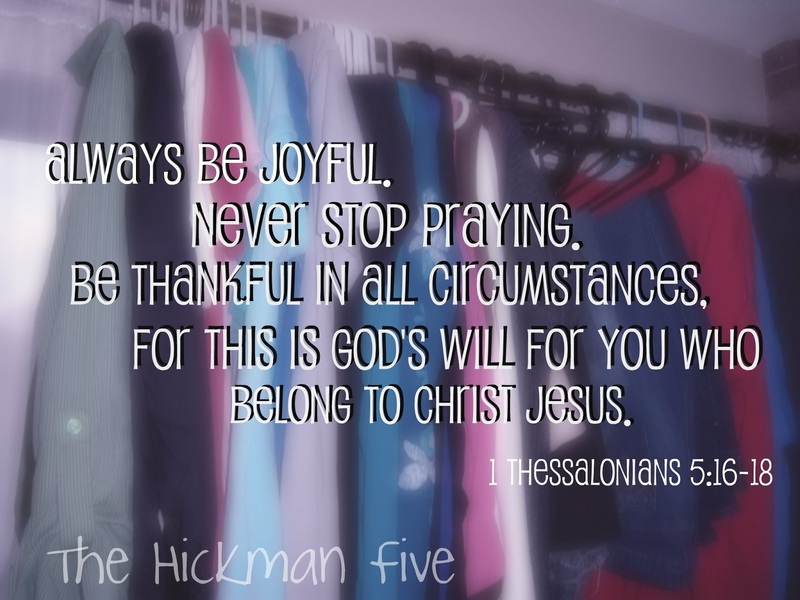 I have recently started to understand more of 1 Thessalonians 5:17 “Never cease praying”. These prayers can be quiet time devotional prayers, where you are praying for specific people. These prayers can be those breathes where you just say, “Come Jesus!” Or these can be those quiet thoughts in your mind where you aren’t really talking to yourself -- these are prayers too. “Never cease praying” really just means to invite God, talk to Him - eyes closed, head bowed not required! All too often when people talk about prayer you hear something like this, “Never pray for patience. All you are going to get is something to test your patience.” The idea behind this comment is that when you pray for patience you are going to be given an opportunity to develop this “virtue”. Lately, every time I hear “Never pray for patience” I cringe. Could it be that you are in need of patience and praying for it or not you are going to be given situations to develop it? Recently, I found myself in the shower reflecting on a class we had been taking at church. The whole “never pray for patience” thing had been discussed. I was standing there in the shower. Saying - God I need the patience to get through this, but I don’t want to pray for patience, because I don’t want the little patience I have left tested. Besides, patience is not really what I want to pray for. It’s more than patience. It’s the strength to wait on your timing. It’s the faith to stay the course. The willingness to keep moving forward. The balance to work hard and maintain what the kids need. That is what I need. I need to be recharged. Since then Hubs got a different job - which adjustments seem to just be falling into place. We worked out schedule for when I can get breaks and when I can get away to write and work. Hubs enforced the schedule already and I feel … recharged. Had I not prayed for patience and all that patience is would this have come through for me? Had I not prayed for patience and all patience is would I feel like a 3 ton weight has been lifted from my shoulders? Had I not prayed for patience and all that patience is would I have realized that boredom is the biggest contributor to the behavior challenge in our house? Had I not prayed for patience and all that patience is would I have been able to find more ways to keep my kids easily entertained? I guess the answer could be maybe, but would I feel peaceful and recharged from it? Probably not. Sometimes you (and by you I really mean all of us) need to remember that sometimes people say what they think needs to be said in the moment. It doesn’t hurt to heed the warning that if you pray for patience your patience might be tested, but patience is more than just patience. It’s strength in the wait. It is hope in the Father. It is joy in the moment. It is letting go of control. It is letting go of your worries. It is holding onto the only thing that will never let you go. Go ahead. Pray for what you need. Even if it is patience.